Mapping sets are organised by category. Categories can be expanded and collapsed . You can link the mapping editor to the mapping sets view with the button. A filter allows to search for mappings. The mapping set perspective displays the mapping set view on the left side of the screen. If you are using a different perspective (e.g. authoring perspective), go to Window > Show View > Other > Snow Owl > Mapping sets to bring up the mapping sets view. To create a new top-level mapping set click on Add new top level mapping set in the view's toolbar. If you want to create a mapping set in a folder right-click on the parent folder and select Add new mapping set from the context menu. In the wizard, you have to specify the following mandatory text fields. Source: Enter the name of the source (e.g. your organization). Click Finish to proceed, and enter a commit comment. The new mapping set is now displayed in the mapping set view, the editor is automatically opened. You can specify additional information (e.g. purpose, source URI) on the Properties tab. To delete a mapping set right-click it in the view and chose Delete mapping set from the context menu. Confirm the deletion plan, and enter a commit comment. 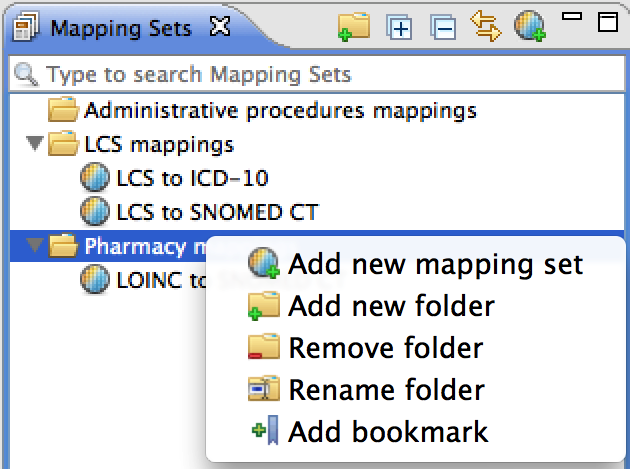 Mapping sets can be organized in folders and subfolders. To create a new top-level folder, use the button in the toolbar. To create a new subfolder, right-click on the parent folder and chose Add new folder from the context menu. You can also use the context menu to remove and rename folders. If you want to move a mapping set simply drag and drop it from one folder to another. Double-click a mapping set in the view to open the mapping set editor. The editor consists of three tabs: Mappings, Properties, and Metadata. By default, the following information is displayed in the columns on the mappings tab. Source code system name: Refers to the terminology or local code system that was used as the map source. Source code: The code used in the source terminology or local code system. Source term: The name of the source code. Target code system name: Refers to the terminology or local code system that was used as the map target. Target code: Code used in the target terminology or local code system. Target term: The name of the target code. You can set the preferences of the mapping editor to display or hide columns. The following information can also be displayed in the editor. Effective time: Date when mapping was published. Status: Displays if a mapping is active or inactive. Correlation: Represents the correlation between the source and the target (e.g. 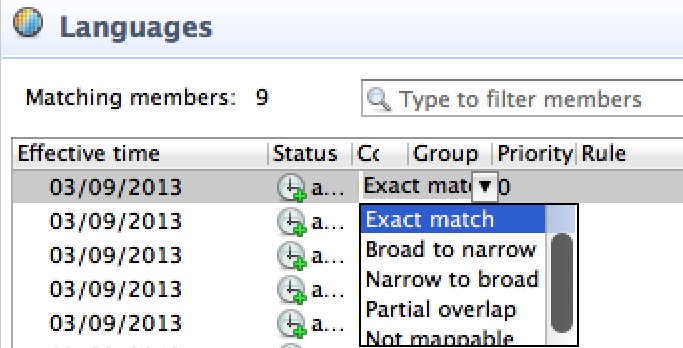 exact match, partial overlap). Group: An integer, grouping a set of complex map records from which one may be selected as a target code. Rule: A machine-readable rule, that indicates whether this map record should be selected within its map group. Advise: Human-readable advice, to give an end-user advice on selection of the appropriate target code from the alternatives presented to him within the group. Source code system OID: Object Identifier of the source terminology or local code system. Source code system version: Version of the source terminology or local code system. Target code system OID: Object Identifier of the target terminology or local code system. Target code system version: Version of the target terminology or local code system. The text field allows filtering members, similar to the reference set editor. You can change information by clicking on the cell: Enter new information or select an option from the drop-down menu. Mappings can be made from the different terminology views or from the search results by dragging them into the editor. Go to a terminology view (e.g. ATC view), mark the concept or code you want to add, and drag it into the mapping sets editor. The term that is dragged first into the editor will be the map source. To add a target drag a concept to the area of the map source until it is highlighted (see screenshot), then drop it. If you want to add another map source drag the concept into the editor without highlighting one of the existing members. You can also add concepts from the search view: Mark the result you want to add and drag it into the mapping set editor. If you want to add all search results, use the shortcut CTRL+A to mark all results, then drag them into the editor. This will create new map targets. To add only selected results, press CDM and click the result you want to add, then drag your selection in the editor. If the component has never been versioned the member version is set to "Unversioned"
and changed since the last versioning, the member version is set to "Unversioned". Mapping sets are capable of representing one-to-many mappings by multiple maps. It is possible to add the same source multiple times, with different mapping targets. If the same source with the same target is added, a validation message is displayed. Select Remove selected mappings if you want to remove the source and the target concept. Select Remove target of selected mapping if you want to delete only the target concept, but not the source. If you want to change a mapping drag the new target concept to the mapping until it is highlighted. A message will ask you to confirm the change. A warning dialog will inform you if you are trying to add a member that already exists in the mapping set. To inactivate a mapping click on the cell and chose inactivate from the drop-down menu. Alternatively you can right-click the member and use the context menu. You can activate members the same way. The button in the view's toolbar allows to show or hide inactive members. Name, definition, and source are mandatory properties that need to be specified when creating a mapping set. Additional information about the mapping set (e.g. definition) can be entered or modified on the properties tab. Name: The name of the mapping set. Definition: Text definition describing how concepts in the mapping set were selected. Purpose: Brief description about the general purpose of the mapping set. Version: A string identifying the specific version of the mapping set. Source: Source of the mapping set, identifying the originator or publisher of the information. Source URI: URL or document URI that provides further details regarding the mapping set. Comments: Additional information can be entered here. Different groupings can be defined on the metadata tab. It's also possible to assign keywords so that retrieval requests can find the relevant groups, and they may assign OIDs for these groups. Right-click a group and use the context menu to add a new group or to remove a selected group. You can also use the button on the top to add groups . Once a group is highlighted, information can be entered and modified in the table on the right side. To define a keyword, use the botton in the toolbar , a default text (e.g keyword 1) will appear in the table. You can enter your keyword by overwriting the default text. You can also create a new keyword by right-clicking on the table, and selecting Add new keyword. To remove a keyword, right-click on the keyword and select Remove selected keywords from the context menu. You can also highlight several keyword and delete them at once. Members pointing to missing concepts are indicated by a small question mark decorator. It is possible to select the desired columns of the Mapping set editor's table. 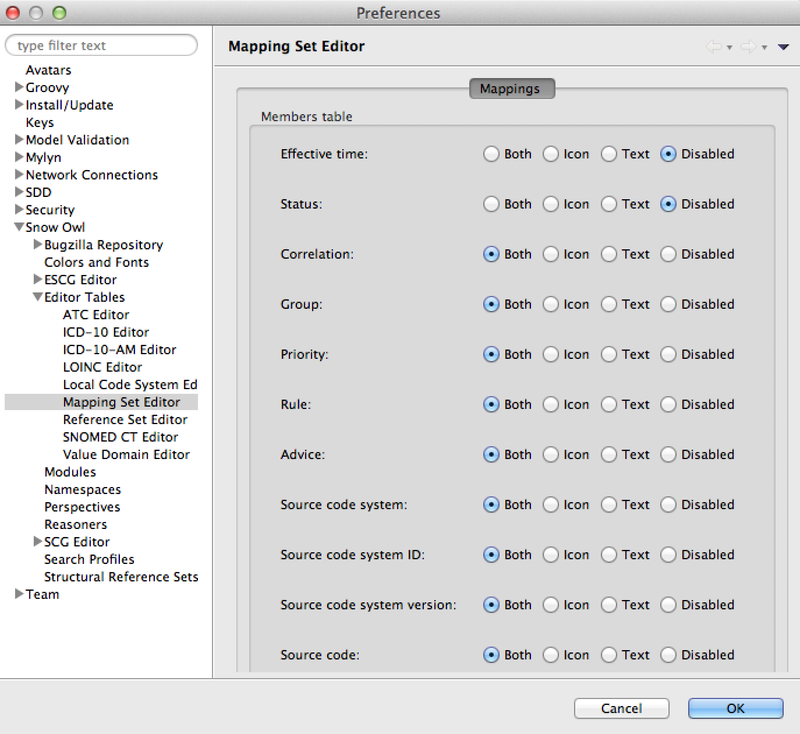 The Preferences page can be access from File > Preferences > Snow Owl > Editor tables > Mapping set editor. 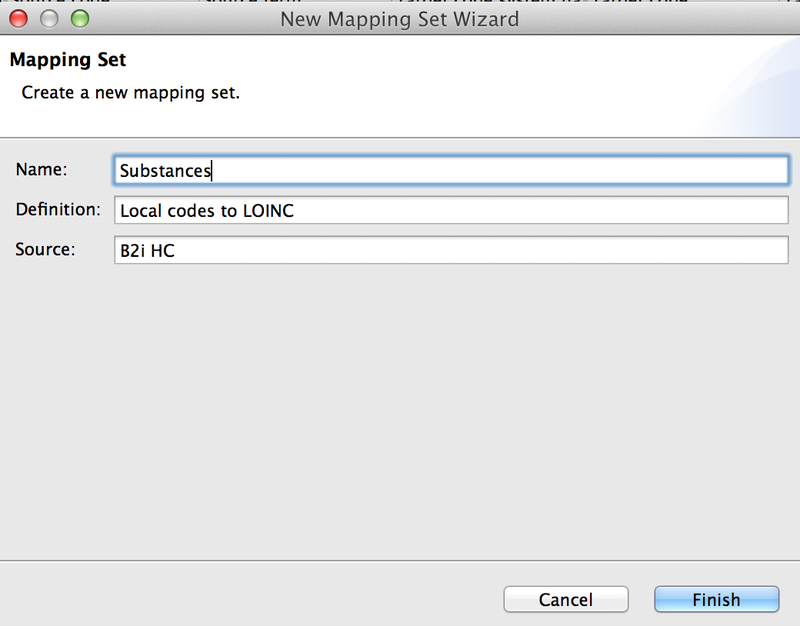 You can also right-click on the table header of the mapping set editor, and selecting Table Preferences. Both: Shows text and icon. Icon: Shows only the icon. This option is appropriate for columns with icons (e.g. Status). Text: Shows text only, no icon. Disabled: Hides the entire column. Click OK to change the settings. Note: After setting the preferences, the editor needs to be reopened to take effect. 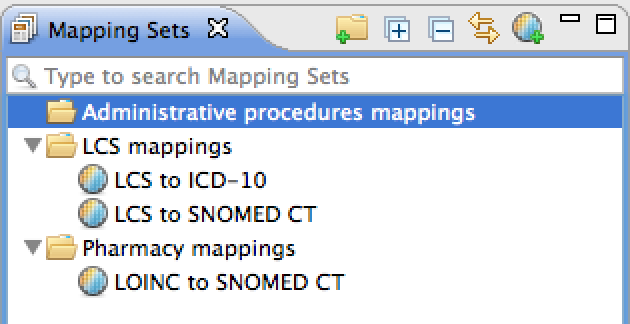 Searching for mapping sets was integreated in the quick search, filter search, and advanced search. For information please refer to the Browsing and Searching section. 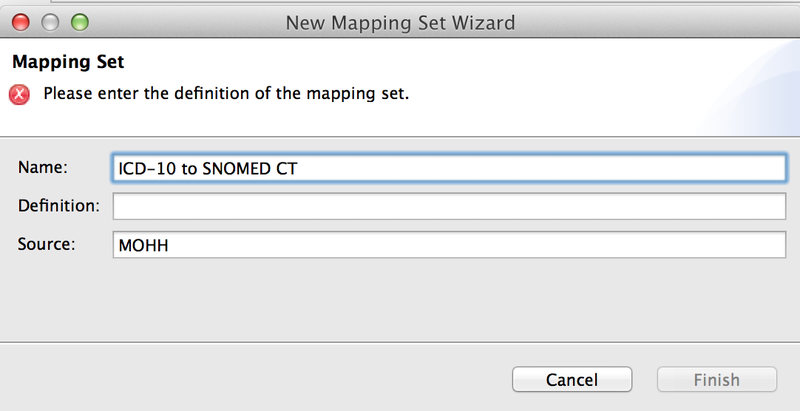 Mapping sets can be imported from, and exported to an Excel spreadsheet. For information please refer to the Importing, Exporting, and Publishing section.